The first pedal powered bicycles were developed in France during the 1860s as the velocipede. Within ten years bicycle clubs were being founded throughout the UK. Many existing clubs claim to be amongst the oldest in the UK including us. But who really is the oldest? Here is a list of those who claim to have started before 1881 – the year of Anerley BC’s foundation. Except they have dropped ‘Club’ from their title and now morphed themselves into “the UK’s National Cyclists’ Organisation”. So I don’t think they qualify in the sense of being a continuing cycle club in our sense. PCC claim to be the oldest continuously active cycling club. Please comment below if you know of any existing pre-1881 club and we will add them to the list. IN 1879. 78 London Cycling clubs and 26 provincial clubs took part in the Hampton Court ride in Richmond park a total of 1100 bicyclist plus unregistered riders – These must have been on the High Bicycle or bone shaker because this was before the safety bicycle was developed. I have a complete list of clubs . I’m currently writing a dissertation on Cycling Clubs in London could you email any information you have please? Hi, been trying to find information on St Johns cycling club, London. My great grandfather had medals from races he won but unable to find any further information. He owned a cycle shop on Old Kent Road and was also designer/manufacturer with his brothers. Any thoughts would be appreciated, thank you. What was your grandfathers name ? He was a member of The Royal Albert Cycling Club of Larkhall Scotland. He was road champion during this time. Any information will be appreciated. I have recently come across a Newspaper Article which stated in June 1869, Mr Davies a Ironmongers Shop in Broad Street Newtown Powys Mid Wales, imported some Bicycles & Tricycles and in that week Newtown began its first Cycling Club. Can anyone provide any evidence that there was a cycling club previous to June 1869 and where this would be please. Great. Could you post them here or email them to admin (at) bizz.co.uk. I’ll check those that are still extan and add them to the list. As we sort though more material, we’re hopeful of turning up some even earlier memorabilia. Alex, very interested with regards to the John Love medal. I am researching the life of someone of that name who was born in Liverpool of Scottish parents. If it’s the same one he cycled up Argyle Street South in Birkenhead on a Penny-farthing. It is a very steep hill ! I’d love to see more photos of 1870s club runs, thanks. 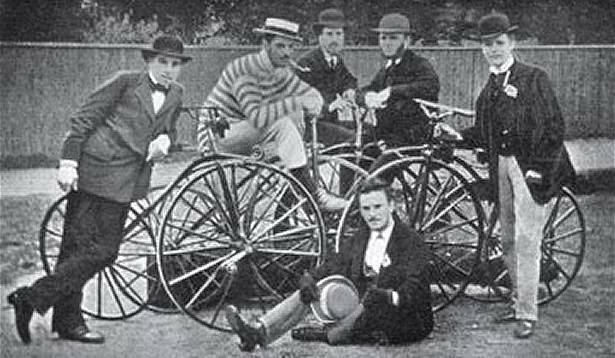 July 7th 1883 was the formation date of the Manchester Wheelers’ Club and we have some events planned to mark our 130th birthday this year. As president of a club which seems to be only a junior member of the UK’s oldest clubs I congratulate evryone mentioned on the list and in this forum. Could someone kindly keep us up to date with any happenings regarding the oldest clubs please? Hi there, this is fascinating stuff. I do think that you have missed Hastings and St Leonards Cycling Club from your list. We started in 1876 and have been in continuous action ever since. Dutch cycle club ‘Immer Weiter’ of Deventer, Netherlands, is from 22nd of October 1871. Just a fun fact! Still active as of today. See http://www.immerweiter.nl. Dutch Olympic Road Race Champion Anna van der Breggen is our youngest member. The (former) top cyclists, from young to old, are all living in our beautiful province of Overijssel. Anyone know of existing cycling club in North East around 1935-1940 ? I am Prash Singh, co-founder of Bike Street Boys, a cycling tour company. I live in Nashville, TN and an active member of Harpeth Bike Club. In 2019 I will be leading a trip for seasoned cyclists like the ones in your ACC in the Himalayas.